Are you looking for the perfect gift for that person in your life who loves to cook? Why not put together a gift basket? 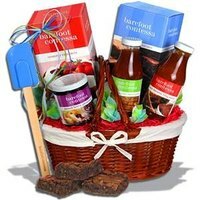 Gift baskets are a great way to personalize a gift. Any food-lover would appreciate a basket-filled treasure trove of kitchen goodies such as baking utensils, spices, cute kitchen towels and more. Create a kitchen-themed gift basket this Christmas for your loved one, and watch her face light up with pleasure as she examines the items you've put together for her. Read on to find out how to do it. Select a basket or other container. Traditional baskets are fine, but you can also get creative by using a large plastic or metal strainer, soup pot or pretty salad bowl. Match the "basket" with your theme: For an elegant kitchen basket, try a stainless-steel wire fruit bowl. For a more whimsical basket, try a colorful plastic mixing bowl with a fun design. Prepare your basket. Line the bottom with tissue paper or a new dishtowel or two. Wrap a ribbon around the handle or edge of the basket. For added fun, sprinkle the bottom with confetti. If you are making your basket far ahead of time, also consider where you are going to hide it. Decide on a theme. Do you want your basket to focus on baking? Spices? Maybe it will be a breakfast basket, and you can fill it with muffin tins, a box of muffin mix and a breakfast recipe book. You could even go with a color theme, or an all-chocolate basket. Themes make it easier to buy for your basket, and make it more cohesive. Make it personal. Put some of your loved one's favorite foods inside the basket, or a gift card to her favorite kitchen store. Tuck in an apron, and slip something sparkly into one of the apron pockets, such as a new bracelet. Splurge on something rare, such as truffle oil, if your loved one really enjoys cooking. The more personal and special you can make your basket, the better time you will have on Christmas morning watching her open it. If you don't know much about kitchen goodies, ask a friend or a relative who loves cooking to help you out with the contents of your basket.